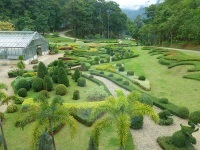 Generally more family friendly than Bangkok, Chiang Mai is a great place to take the kids while on holiday in Thailand. The national way of life of sanuk (fun) is enough to keep the kids on their toes. Couple that with the friendly, child-loving qualities of the Thais, and you've got a recipe for a fun-filled holiday with the family in Chiang Mai. Take the kids to watch the animal shows in the Mae Sa Valley, where monkeys ride tricycles and play basketball, you can hold a cobra at the Mae Se Snake Farm, enjoy the views from an elephant's back at the Elephant Conservation Centre on the Chiang Mai-Lampang road, swim and play under a waterfalls in the Doi Suithep-Pui National Park, go fishing in a local pond, or visit Chiang Mai Zoo's two giant pandas from China, Chuang Chuang and Lin Hui. Be sure to make sure the kids have plenty of sunscreen on and kit them out with a sunhat as the temperatures can be searing. With all these attractions and more, children on holiday in Chiang Mai will be entertained from dawn to dusk.